Product information "Beko DC7112W 7KG CONDENSER DRYER"
The Beko DC7112W condenser tumble dryer takes the hassle out of getting the family's clothes dry. A choice of 8 drying programmes takes care of all your clothes and a reverse tumble action ensures they don't get tangled, making ironing a breeze.The 7kg capacity lets you dry larger loads – up to 20 hand towels in one cycle, saving you time and energy.With the Automatic Anti-creasing function the drum rotates periodically for up to 2 hours after the cycle has finished. 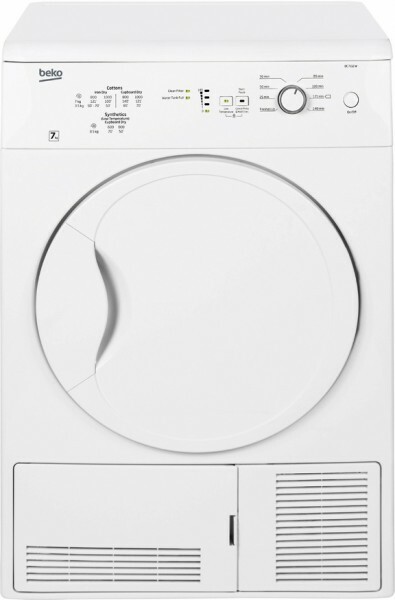 This gentle drum action separates the laundry to ensure it remains crease-free until you are ready to take it out.The small 54 cm depth delivers a flush finish with your kitchen cabinets and the side porthole door makes easy work of loading and unloading your dryer. Related links to "Beko DC7112W 7KG CONDENSER DRYER"
Customer review for "Beko DC7112W 7KG CONDENSER DRYER"